We have somehow managed to label some colors as being suitable for men, another set of colors that either appear too feminine or do not have that masculine appeal. So where do we stand on green, is this a color that has a large male following. Nature has painted green on landscapes, endowed trees with green leaves and spread green on meadows and grasslands. Look at green and it reminds you of nature, of life and freshness. This is a universal feel and is not restricted to any specific gender. What about men wearing green, is it common or seldom seen. Green suits and ties are not too rare, it is just that men seem to prefer the darker shades of green for their clothes. Pale green shirts are also quite common, worn with dark olive green or very dark grey or black trousers. A man wearing a pair of glasses with a bright green frame, can expect to attract some curious stares. Green watch dials are okay but, not many green watch straps would sell each year. There is one green accessory that most men seem to be comfortable wearing, green gemstones set in gold or 925 silver jewelry. Men's rings with green gems are quick sellers, this applies to gems with a range of green shades. From the bluish green of Colombian emeralds to the deeper green of tourmaline, green gemstone rings for men have a consistent demand. Before science and research entered the realm of gems and crystals, it was often presumed that all green gems are emerald! Even Cleopatra mistakenly treasured a bunch of peridot gems mistaking them to be emerald. So do men who wear a ring with a green gem appear gentle or lady-like? Just the opposite, men wearing green gems have a responsible and understanding appeal. Being a man is not all about physical toughness and cold stares, it also involves taking responsibility and being there when help is required. Millions of people across the world believe in the special powers of gems, crystal healers often recommend specific gems to address specific situations or problems. Green gems are believed to encourage harmony and reconciliation at home, this is something that every family would hope to have. Pin pointing the most favored green gems for men is not an easy task, men might settle for a specific green gem based on factors like price and toughness. You might hope to wear a large green gemstone ring with an emerald but, the price of big emeralds could put that men's ring beyond your budget. 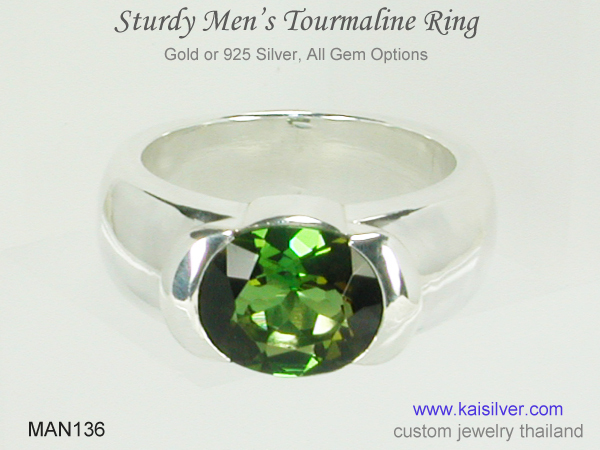 Similarly, if you wish to wear a men's green stone ring with a sturdy gem, green tourmaline might be a good investment. Besides being popular for their color and refreshing appeal, green gems can also be worn for reasons of traditions and beliefs. A men's green birthstone is a good example, the birthstone charts adorns some awesome green gemstones. 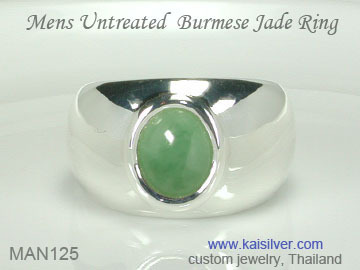 Men born in the month of August and May would wear a green gemstone ring that has a special meaning for them. The centuries old practice of wearing a specific gem, based on the month in which a person was born is active even today. August has peridot a sparkling green gem as its birthstone, the historically popular emerald takes its position on the charts as the May birthstone. With sapphire representing the month of September, it is possible to wear a green sapphire gemstone ring. October has opal and tourmaline as its birthstones, the immensely popular green tourmaline is a great choice to celebrate an October birthday. Spend some time reviewing the Men's Green Gem Ring Report and get equipped with information, that is both interesting and essential. The dazzling world of gemstone jewelry can be tempting, it is also riddled with confusion, smart sales talk and high pitched trade jargon. Your first objective when looking for a jewel, should be to carefully evaluate and pick a reputed jeweler. A good and worthy jewel cannot come from a doubtful or incapable provider. Learn to separate sales hype from facts. Look for jewelers who provide detailed information on websites and care to reply to your communications in similar detail.